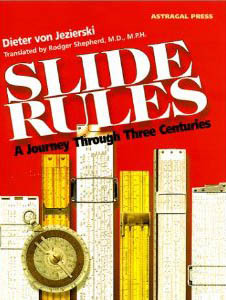 Dieter von Jezierski's "Slide Rules"
Originally published in German, in 1977, as the first major book on the history of the slide rule since Florian Cajori's A History of the Logarithmic Slide Rule, this newly revised and translated edition of Slide Rules, A Journey Through Three Centuries, offers readers a fresh, more Continental, perspective on this most fascinating of calculating instruments. The book is an important piece of historical and technological research, in which the author includes the history of the slide rule from its beginnings in the 17th century, through its gradual adoption and development world-wide during the 19th and 20th centuries, to its sudden and almost complete demise in the mid-1970's. He also covers the evolution of various slide rule components, technologies and manufacturing processes, as well as histories of the major slide rule manufacturers and their product lines during the last 100 years. There are detailed references to original sources throughout, which the reader may use as a springboard to further study and research. Readable and very informative, this is a book that, together with those of Cajori and Peter Hopp, any slide rule collector or historian will find of great interest and real benefit.